This article is currently undergoing a major expansion or revamping by The Rim of the Sky. However, you are free to help in the construction of this page by improving it—use the talk page to do so. Please review the edit history if you would like to see whether the page is still being worked on. If the editor who placed this notice has not made any changes in a while, please contact the editor or, if they're inactive, remove this template. This WIP notice was originally posted on 04:44, 18 February 2019 (UTC). This article is about the Tribunal god Sotha Sil. For the city of the same name, see Clockwork City. Sotha Sil was born in the town Ald Sotha, in what is now known as the island of Vvardenfell, in the Ascadian Isles region. Ald Sotha was the seat of House Sotha, a minor house of the settled Chimer in the early First Era. The town was destroyed by Mehrunes Dagon early in the First Era; Sotha Sil was the sole survivor, having been saved by Vivec. After Nerevar's death, the councilors of Nerevar and the Tribunal of Vivec, Almalexia, and Sotha Sil came to power among the Dunmer. They then went against Nerevar's dying wish by using the profane Tools of Kagrenac on the Heart of Lorkhan in order to steal its divine essence for themselves, becoming gods to the Dunmer people. The event led to the Daedric Prince Azura cursing the Chimer, turning them all into the Dunmer. It was Sotha Sil who told Azura who was rebuking him that her time as a god was over, and that the Tribunal as the new gods would be wise and caring of the needs of their people. Sotha Sil was one of the few who can resist Azura's curse but chose to remain with his Dunmeri appearance. He would aid in the transition of his people into the Dunmer, getting them to accept that it was not a curse but a blessing, and that they were new Mer, civilized and able to speak directly to their patrons, the Tribunal. 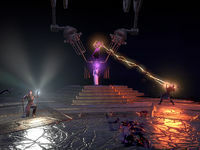 The Clockwork City is believed to have been constructed some time after the rise of the Tribunal at the Battle of Red Mountain, when Sotha Sil harnessed divine power from the Heart of Lorkhan with the use of Kagrenac's Tools in the First Era. Sotha Sil created the Clockwork City for various reasons, all of which were to serve a noble goal. He saw the Aedra's creation of Nirn as flawed and in order to perfect it,[UOL 1] he built the Clockwork City to ensure the redemption of Tamriel, unify competing forces, and destroy the Daedra. 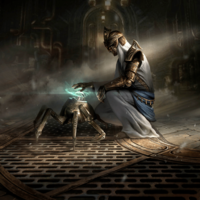 During the genesis of the city, Sotha Sil's vision of a self-contained world made of brass and machinery was very ambitious and he developed highly advanced methods to see it through. He created the Celestiodrome, which surrounds the entire realm in the form of a glass globe which is perceived by the realm's inhabitants as its sky. The Celestiodrome is capable of mimicking both a day and night cycle, and the rotating girders installed on it allows for proper topography to be formed within the Realm. In an effort to make the Clockwork City habitable, Sotha Sil sought to achieve the proper humidity needed for a breathable atmosphere for his realm. He created the Halls of Regulation, which maintained the city's water cycle, breathable air, humidity, temperature, wind currents, as well as creating drinkable water. He drew inspiration from the Dwemer, and their influence in his work is rumored to be traceable as far back as before the disappearance of the Dwemer. Among these influences was his research on Dwemer tonal architecture. He refined it further and created items based on their research, such as tonal forks that could function as a divining rod. 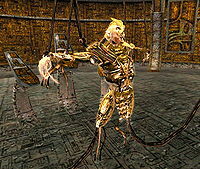 He also worked with Dwemer constructs, tinkering in ways beyond the capabilities of even the most talented individuals. Sotha Sil created the humanoid automatons known as Factotums to maintain the Clockwork City. Early variants were built with a design that resembled Dwarven automatons and were constructed from both Dwemer and clockwork parts. Ultimately his style became his own and the city's structures, vegetation, and wildlife are all mechanical constructs of his own design. Sotha Sil would go on and create part organic, part inorganic creatures known as Fabricants,  which are rumored to be the first step towards the convergence of Nature and engineering. Towards the end of the First Era, around 1E 2920, Sotha Sil spent some time on the Isle of Artaeum, where he taught some of the new mages of the Psijic Order. Sotha Sil also further tinkered with his clockwork creations as well as Dwemer creations and left behind some of his creations when he departed back into the Clockwork City. After a Daedric disaster in the village of Gilverdale, Sotha Sil journeyed into Oblivion via the Dreaming Cavern and made a pact with eight of the more prominent Daedric Princes: Azura, Boethiah, Hermaeus Mora, Hircine, Malacath, Mehrunes Dagon, Molag Bal, and Sheogorath. known as the Coldharbour Compact. The exact terms of the pact are unknown to most inhabitants of Tamriel. At the time of the pact, the Princes agreed not to answer any summoning by amateurs until the war between Morrowind and Cyrodiil ended; only the Psijics, along with sorcerers and witches, could counsel with the Daedra. Sotha Sil's pact failed to prevent the destruction of Mournhold. A Dunmer witch managed to summon Mehrunes Dagon to seek vengeance on the Duke of Mournhold following the death of her child. Although Sotha Sil and Almalexia were too late to prevent the devastation, they managed to banish the Prince of Destruction back to Oblivion. Around 2E 583, Nocturnal tried to take control of the Clockwork City. She summoned Sotha Sil's Shadow, who replaced him as ruler of the Clockwork City. Meanwhile, one of the Clockwork Apostles, Chancellor Gascone Dusant, sought to deliver the Skeleton Key, which had been accidentally found by a Factotum beneath the Brass Fortress, to Clavicus Vile, only for the Key to be stolen by the Blackfeather Court. The Soulless One, assisted by Divayth Fyr and the Clockwork Apostles, unveiled the plot, but were unable to reclaim the Skeleton Key before it was taken by Sotha Sil's Shadow. Using the key, Nocturnal and the Shadow attempted to seize control of the Clockwork City, but were stopped by the Soulless One, Divayth Fyr, and Proctor Luciana Pullo, who rescued Sotha Sil by defeating his Shadow. Sotha Sil then gave the Skeleton Key to Divayth Fyr for safekeeping. Sotha Sil became involved directly in the affairs of the Nirn, when Nocturnal subsequently tried to take control of the Crystal Tower. Using a technique she stole from Sotha Sil involving utilizing life energy as a power source, she planned to use the life energy of Nirn, and then the energy of the other Daedric Princes afterwards, to amplify the Crystal tower to make her power limitless. Nocturnal's plan was foiled by the Psijic Order and the Soulless One, with the assistance by the two betrayed Princes (Mephala and Clavicus Vile) and the champion of Meridia known as the Golden Knight. The divine power of Meridia's Dawnbreaker was then used to restore the tower's stone, Transparent Law. Sotha Sil then made negotiations with both Mephala and Clavicus Vile and the two have agreed to a compact to put an end to their direct meddling. In 2E 882, when the Tribunal visited the Red Mountain for their annual pilgrimage to replenish their divine power, the reawakened Dagoth Ur and his minions ambushed them and drove them away after nearly killed them. The event resulted in the Tribunal being cut off from access to the Heart of Lorkhan, and caused Sotha Sil to respond by beginning development of a replacement heart. 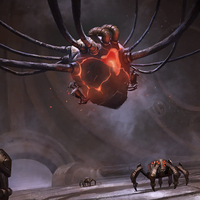 His solution was The Mechanical Heart, a mechanical replication of the Heart of Lorkhan, to act as a new source of divinity and as new power source for his Clockwork City. The development would not go smooth, as The Heart became unstable in its early development, and to prevent the Heart from destroying the City, he created his own variant of Kagrenac's Tools to control, shape, or even dismantle the Heart if necessary. Sotha Sil went to great lengths to keep the Heart from those who would misuse it. He stored it within the Chamber of Lorkhan, located deep in the Clockwork City's Cogitum Centralis. Sotha Sil also hid his tools as a precaution across Nirn to prevent people from stealing the Heart's power. 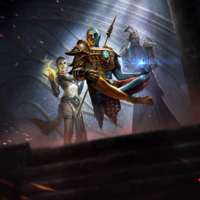 The Tribunal were able to kill Dagoth Ur and his kin after this initial setback, but they were always revived by the Heart. To contain them, the Tribunal erected the Ghostfence around Red Mountain. 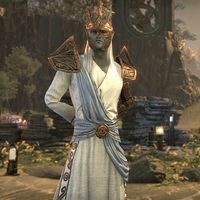 Sotha Sil once spent time counseling, guiding, and protecting mortals, loving them perhaps more than either Vivec or Almalexia. He is said to have felt the stress of each of his people, but assigned them no more load than he knew they could bear. Sotha Sil’s traumatizing childhood may be one of the first factors that contributed with his deteriorating mental health. Him being the only survivor of his House being destroyed by Mehrunes Dagon may be why one of his goals was to destroy the daedra. His ascension into godhood was accompanied by a silence described as coming from a place of grief and deep regret, evidently from his betrayal of his oath to Indoril Nerevar. His lifework, the Clockwork City, was created to serve as a world-shaping device, but he felt sorrow from it being built on betrayal and untold horrors. In time, Sotha Sil became detached from the real world. He gradually lost touch with the affairs of the Dunmer, the rest of the Tribunal, and eventually all of Tamriel. His obsession with perfecting his Clockwork City, and the fact that its functions is very dependent on his presence, was one of the contributing factors that would ultimately cause him to become distant, reclusive, and would lead his participation with mortal affairs to dwindle. His last known participation of mortal affairs was in 3E 417, when after centuries of becoming weaker and more desperate, Sotha Sil and Almalexia lost two of Kagrenac's Tools, Keening and Sunder, to Dagoth Ur's forces. Vivec rescued them, but they could not recover the stolen Tools and had to flee Red Mountain. Sotha Sil's Legacy lived on as the Clockwork City continued to be powered by The Mechanical Heart after his death. The Heart finished being fully constructed by his machines 207 years after his death in 4E 200  However, in stories tell of a Forgotten Hero who followed a former Clockwork Apostle, Mecinar, into the city to prevent the latter from claiming the Heart's power. The stories has an unclear ending, where one rumor claims that the Heart was destroyed to strip Mecinar of its divine power so that the two can fight on equal ground, and as a result the city ceased functions and its inhabitants were forced to abandon the city. In another rumor, the hero is said to have used the Heart to harness its power and fought Mecinar on equal ground, and the Heart would live on, along with the city. The Heart was too much for the hero to handle and was disintegrated, with the hero's consciousness living on within the city. For game-specific information on Sotha Sil, see the Morrowind, ESO , and Legends articles. This page was last modified on 1 March 2019, at 08:59.